Oh, how I wish this story was different. For more than a decade, my sons were in Cub and then Boy Scouts of America (BSA). They held leadership positions and were close to their Eagle Scout awards. One was elected to BSA’s national honor society, the Order of the Arrow. Only one in seven Scouts attains this rank. We spent countless hours with a group of boys and their dads. We became like a family. More activities and adventures than we could count bound us together in affection, commitment, and service. Then in 2013, BSA decided to allow openly homosexual Scouts into the organization. This week the Wall Street Journal reported that the BSA might declare bankruptcy because membership is cascading downward and it has to pay overwhelming legal costs to settle sexual abuse cases, some dating to the sixties. I was there at the annual convention when the vote was taken. I’d gone to Dallas on behalf of the Family Research Council, where I served as senior vice-president. At the meeting, I was forbidden from distributing FRC’s tasteful, beautifully presented material calling for retention of the historic policy about homosexuality. I had the Dallas Gaylord Conference Center’s print shop run copies of the ad FRC had taken out in the Dallas Morning News to distribute to convention delegates. The shop’s manager called hotel security and I was escorted out of the building. Bear in mind that I was a paying guest of the hotel, father of two Scouts, a member of one of the largest Scout troops on the Eastern seaboard, a patron of a print shop paying for a legal service — and, I guess, a threat to Scouting’s brave new world. Internal Scout polling showed that hundreds of thousands of boys would leave if the policy changed. The vote was lopsidedly in favor of changing the policy anyway. The then-president of Scouting was asked why the cut-off for openly gay Scouts was 18 years of age. He responded, “We had to cut it off somewhere.” I thought, how absurd. Gay activists would never accept this arbitrary rule. And with good reason. If one allows homosexual youth to openly take part in Scouting, why not openly gay young men? And openly gay adults, for that matter? As I predicted at the time, this was only the first step toward the demise of Scouting. What was once the nation’s premier organization for teaching boys how to become resourceful, honorable, and morally brave men has become an arena of political correctness. In the BSA’s effort to become acceptable to liberal elites, it has become irrelevant to America’s boys and their families. Of course, the mainstream media piled-on with endless stories about openly gay teens upset that Scouting excluded them. With little or no reporting about how Scouting families felt about “mainstreaming” homosexuality among their boys. So, an organization that for a century had stood for trustworthiness, bravery, and honor caved-in. And in the intervening years, Scouting has been devastated. And now Scouting faces bankruptcy. Families have voted with their feet. Scouting’s membership is down from 2.6 million in 2014 to 1.8 million today. That’s a loss of almost a third in just four years. With the Mormons planning to leave Scouting in 2020 due to all the changes, another 280,000 Scouts will be gone. About 140,000 Mormon Scouts have left already. Those Scouts involved in the getting their Eagle rank also put in about 900,000 fewer service hours in 2017 as compared to 2013. That means many community projects went without volunteer assistance. A few days ago, the Washington Post reported that Scouts’ current recruitment effort “raises questions about what it means to be a girl or a boy.” If the once-leading manhood training organization in America can’t tell the difference between a boy and a girl, it deserves its whimpering fate. The good news is that there is a great alternative, one I am grateful to have played a role in founding. Trail Life USA has provided a truly Christian and masculine-focused alternative. My sons became the ninth and tenth boys in Virginia to achieve the Freedom Rangeman award, Trail Life’s highest honor, one harder to get than Eagle Scout. They gave up years of hard work and great joy in Scouting to help create a new organization. I am proud of them. When our troop left Scouts for Trail Life, it felt like a death. Friendships were strained. A community of boys and men, one created over years of camping and hiking, skits and laughter, prayer and sacrifice, was sundered. But now the death is much bigger. It is the demise of a once-great institution by its own hand. I so wish it were different. Yet God is doing a new and wonderful work through Trail Life. For that, we can rejoice. The organization sought to save its life by departing from right action, and lost it. The principle is universal, but seldom do we see it play out so starkly and visibly. They lost sight of their primary mission, not to mention the Scout’s Oath. Interesting point as the orthodox Scouts could not save their institution by standing fast to their traditional organization. Is this principle sufficiently universal to apply to the Roman Catholic Church given the same forces and strategies are being applied, the same glide path being imposed. Orthodox anything can’t compete with big money. Big money corrupts absolutely so buys a bit of time on this side of the grave while big money has no power on the other side of the grave where Truth prevails for eternity. I am less optimistic about this “other side of the grave”. That you are less than optimistic about the “other side of the grave: infers that your luck is running out on you. Perhaps you may read something within this forum to encourage you to migrate from nothing to Someone. If not then perhaps the arguments from reason by Edward Feser may be of interest to you….that if for nothing else to have a better appreciation for your position. American Heritage Girls was also founded as an alternative to Girl Scouts, which went off the rails before Boy Scouts did. My daughter enjoyed several years in it, earning many badges and service stars. It’s good that Christians have these alternatives. 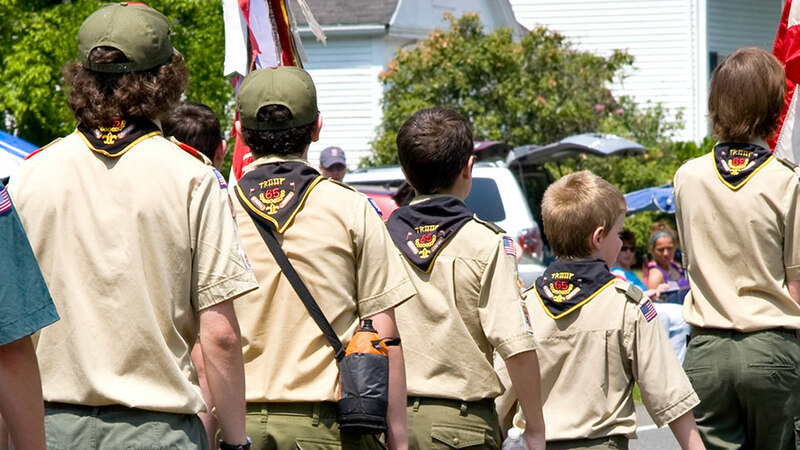 Forced integration of gay scouts into the BSA is as pernicious as the gay lobby in the Catholic Church. Morally bankrupted policy encouraged abuse and coverup. The common denominator is the ruin of society by the left for personal, political gain and its endless cycle of destruction. The obvious question and concern will now be ; what’s to stop the perversion pushers from infecting “Trail Life” and destroying its values, as they have done with the Boy Scouts ? Been in scouting for 40 years. This is my last. I don’t recognize this organization anymore. Sadly, this seems like it’s all about the money. Sure there’s some SJW “wokeness” but I believe it comes down to National Council and the big city councils craving the big donations from major corporations and institutions. Lose your sponsors or lose your members. A no-win situation. As a cub scout, a boy scout, and a supporter of the organization for 40+ years, I pulled my grandson from the organization after the politically correct leadership made bad judgments. They are a shame to their families and to the families of all scouting. Our troop recites the Scout Law ever week. ” … To keep myself physically strong, mentally awake and morally straight.” Too bad the professional scouters couldn’t even follow their own law. They lost sight of the goal, and thought that fundraising from the politically correct corporate world was more important. A pox on all their houses. I’m gay. I wouldn’t even consider letting guys like myself to be a part of the Boy Scouts. Life has enough problems for us…why would we put ourselves in what could be a very compromising and tempting situation…let alone the potential to harm another young man. Rest in peace BSA. Wow. May God bless you, Mikey. My cousin enrolled her son in Boy Scouts after his father died. She hoped he’d maintain some male connection. She should’ve enrolled him in the Girl Scouts–he now wears dresses and Dan calls himself Danielle.